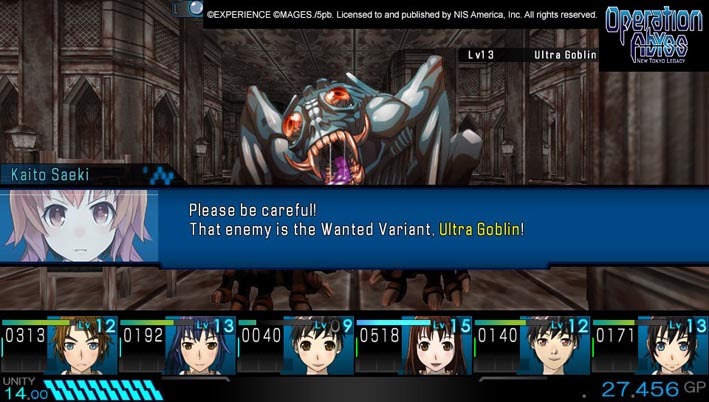 Operation Abyss: New Tokyo Legacy's setup is one that every fan of the anime dungeon crawler genre knows: the player assumes the role of an ordinary high school student who also secretly protects Japan from monsters. This PC release from Experience, Inc. differentiates its storyline from other titles that use the same tropes by moving its action into the near future, where players operate under the shadow of an increasingly ominous political climate. While environmental puzzles in dungeons certainly aren't in short supply, players can also engage in the more long-term background puzzle of comparing Operation Abyss's world to their own and contemplating the extent of the differences. It's a title rich in food-for-thought, which you sorely need while grinding for experience and locating mission objectives through trial and error. Prepare yourself for a maverick program that's equal parts genius and junk code. Operation Abyss is a good game that tries to be great and makes it there a modest, yet memorable, fraction of the time. The narrative rings genuine in both broad strokes and small character moments, although it isn't without its problems. For example, its strong opening scene receives inadequate follow-up, and the player both enjoys and suffers from a nebulous identity in the game world that goes beyond your traditional, silent, self-insert-friendly protagonist in a JRPG. You aren’t a character; you don't have a presence of your own. Instead, you control a “squad” of six fully customizable fighters. This would be fine if it weren't implied initially that you are a singular person. For example, in the opening sequence, the player awakens as an individual hostage to dangerous humanoid “Variants. ” A mysterious man claiming he's “your ally” rescues you. Afterward, you build a squad of six fully customizable characters but have no idea which member of your party the rescued hostage is. It's a dissatisfying plot hole and a missed opportunity for building a bond with the guy who showed up to help you—who, by the way, you don't get to meet again for at least three hours, despite his thematic importance. The writers don't frontload your interaction with him, and as a result, the initial intrigue in his role players feel turns to impatience while grinding through the squad's first handful of adventures. The special powers exhibited by the player's squad are only found in teenagers. Once you hit twenty or so, you lose your ability to damage Variants. The writing embraces the ethical problems of Japan's police knowingly training and throwing high school students into danger, and the chief police detective you interact with expresses his frustration with the growing obsolescence of his role. He and the rest of professional law enforcement stand on the sidelines and secure perimeters around Variant nests, taking an auxiliary role beside amateurs (your squad) who've just been handed superpowers. Operation Abyss's writing embraces the implications of its mechanics, and it's a satisfying critique of staple tropes in the genre. The Encounter Gauge mechanic livens up repetitive dungeon crawling by increasing enemy difficulty with each battle you refuse to retreat from and win. It encourages power tripping and risky behavior in chilling parallel to statements made by recurring NPCs that allude to their inner struggles. For example, the mysterious man turns out to be a former member of a squad like your own. He lost his powers due to his age after many years of service. He was exceptionally proud of the abilities he used to possess, and he can't accept a non-combat police role. He's become a vigilante who still hunts monsters and tries to rescue their prey—including you, the player, whom he saves in the opening scene—despite lacking the power and the advantage he used to wield against them. The visual you see of him after he protects you from Variant attack shows his injuries from the brief battle and hints at the destructive path you, too, might crawl down. Operation Abyss's dungeons shun procedural generation. Every player explores identical area maps created by the developer. That's an unusual choice in a genre where procedural generation of levels has become not only fashionable but easy. Supposedly, procedural generation maintains challenge and novelty in dungeon crawlers with repetitive gameplay. Operation Abyss paradoxically achieves those same ends by opting out of the proc-gen industry trend. Instead, the Memo system allows players to leave short messages for one another in dungeons (“Hidden Door Search Straight Ahead”; “Easy Victory”; “Don't Trust Memos”), which creates emergent experiences that are only possible because the dungeons' layouts don't change. You can play with a controller or a keyboard, and all buttons and functions are easily rebindable. This is a good port that lets you change control schemes and key bindings mid-fight if you feel like it. The default binds for keyboard users are clunky, but you can fix it immediately and use your mouse in tandem with keys for a smooth experience. Unfortunately, Operation Abyss lacks in monster variety, and strategy has little impact. You'll win or lose most battles before you enter them as a result of a combination of RNG, party composition, and whether you've done enough grinding to get the stats to survive in an area yet. While the Encounter Gauge offers an innovative way for players to organically manage their own difficulty, you'll still face dramatic artificial difficulty spikes when you fail to bring items to a boss fight you need but didn't know existed. The story, while full of promise, suffers from inconsistent pacing, delaying characterization in favor of exposition. Combat is straightforward and familiar but more tedious than challenging. Luckily, this title still does enough things right to earn players' patience for its flaws. Jaded genre fans who enter it with their eyes open will be rewarded with a thoughtful and refreshing experience. 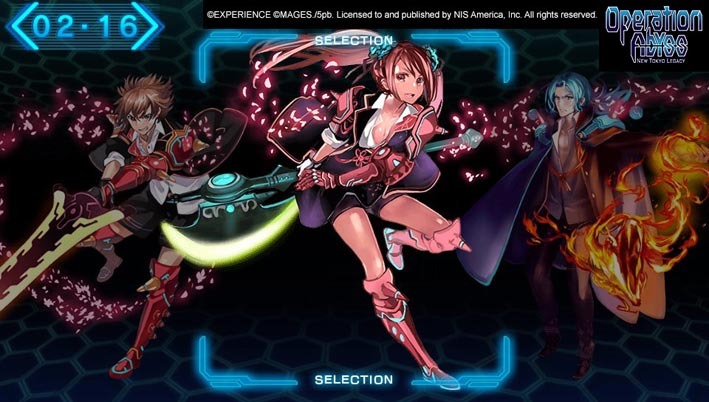 Although it succeeds in both maintaining familiarity for fans of the genre and introducing novelty, Operation Abyss: New Tokyo Legacy fails to deliver engaging combat or efficiently introduce players to its unique mechanics. It boasts a solid and engaging story that starts with strong momentum, but suffers from distractions which ultimately hold Operation Abyss back from capitalizing on its strengths, resulting in a title that is simply good, despite clear potential to be great.